Many of us will know the Ripley Scroll. There are a number of copies of this and most of them have similar imagery, with only minor variations. However, there are a subgroup of these (two in the Bodleian and two in the British Library) which have a substantially different sequence of images. I thought it might be interesting to show an image from one of these, British Library Ms Add. 5025 III. 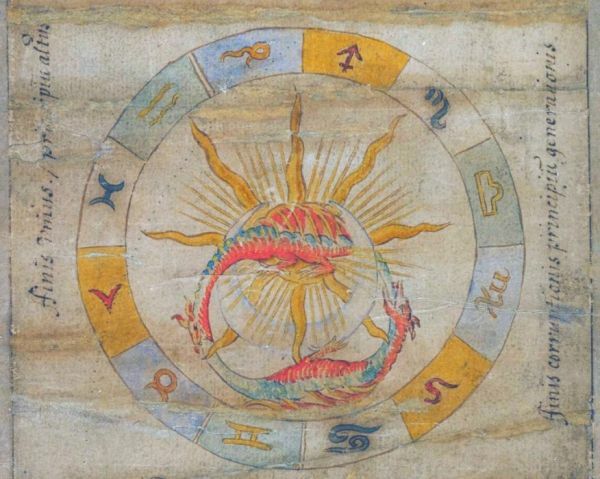 This shows a circular zodiacal space, with each of the signs coloured in the appropriate elemental colour - thus Leo, Aries and Saggitarius are in red, signifying fire. Inside this zodiacal circle we see the conjoined Sun and Moon. Wrapping themselves around them are two dragons forming an ouroboros by biting each other's tails. These have a red underbelly and a bluish upper body and sport yellow and orange wings. Thus they incorporate the four elements that we saw coloured in the zodiacal forms:- red-Fire, yellow-Air, blue-Water and orange-brown-Earth. These two are caught in a dynamic dance, seeming to struggle for supremacy. The Latin text on the left states "finis unius, principium altus" - the end of the one, the beginning of the other. While that on the right states "finis corruptionis, principium generationis" - the end of the corruption, the beginning of generation". 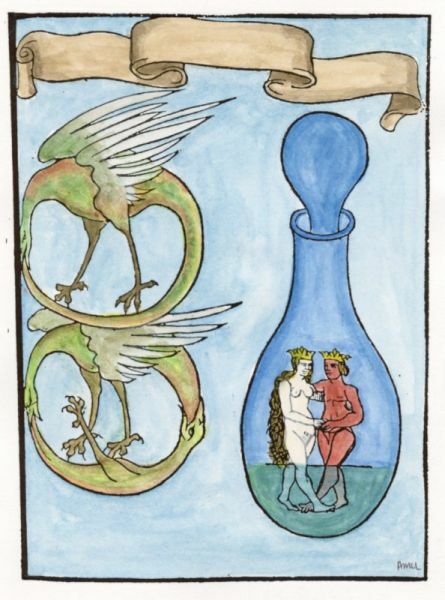 Of course this has to be seen within the context of the set of images in that particular Ripley Scroll, but it is interesting to view a relatively straightforward component of that complex work. 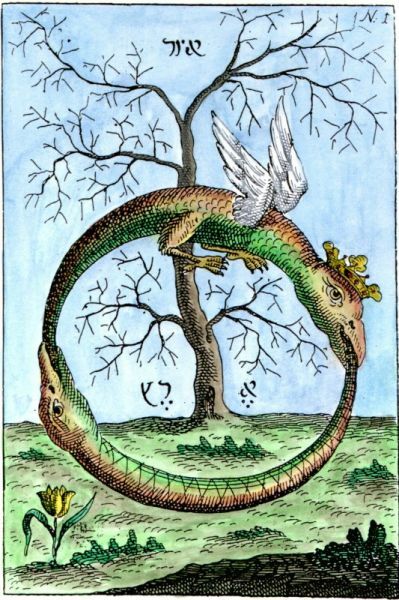 There are a number of double ouroboros depicted in alchemical works. Here is one from Reusner's Pandora, 1582, copying from the early 15th century Buch der Heiligen Dreifaltigkeit. The colouring is my own. 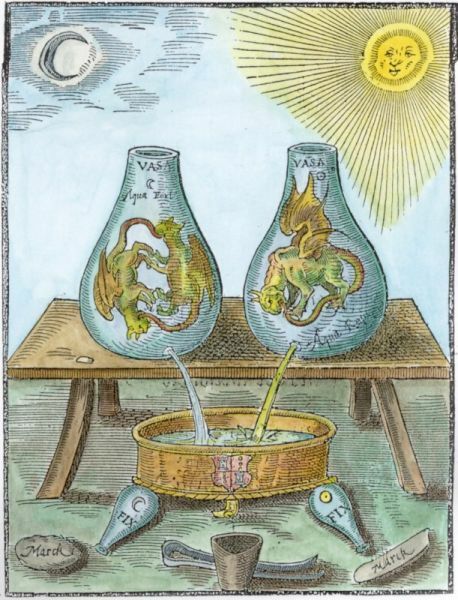 Another image from this time from Thurneisser Quinta Essentia in the late 16th century. One of the best known will be that in the Abraham Eleazar, Book of Abraham the Jew.